Hippy-hoppy Easter is on it’s way! It is time to start a new Easter tradition and make some great Easter crafts that are pretty enough to double as DIY Easter decor! Here are 5 fun DIY Easter decorating ideas and all of them are great crafts to do with your kids for Easter. I hope you enjoy making these and decorating your home. 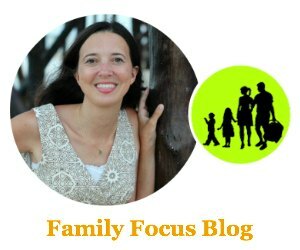 Let us know your favorites and tag us @familyfocusblog or #familyfocusblog! Simple and festive this fun DIY Easter Egg Garland from Honey & Fitz lets everyone know that spring is in the air! 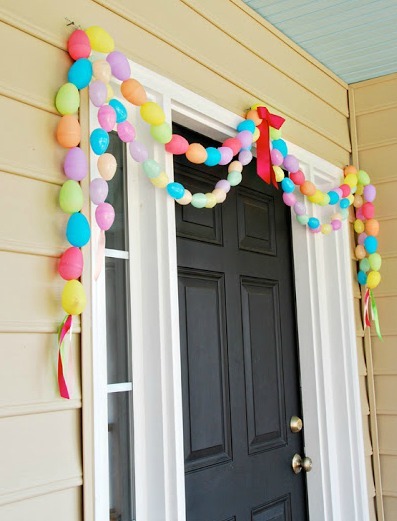 All you need is a ribbon and plastic Easter eggs and you are on your way to a beautifully adorned doorway. This is one of my favorite DIY easter decorating ideas. These eggs are fun to make and come out in very pretty shades. It can be surprisingly easy to make your own natural dyes for Easter eggs. Then these eggs can be used for DIY Easter decor in a basket or bowl as a centerpiece for Easter day. 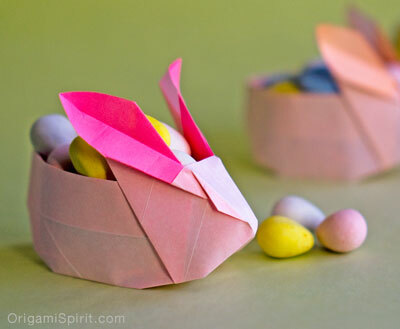 You can turn one sheet of paper into an adorable Easter origami bunny basket. These little containers are perfect for filling with small candy and will be adorable on your coffee table or mantle! This is sure to be a favorite for your kids of these DIY easter decorating ideas. 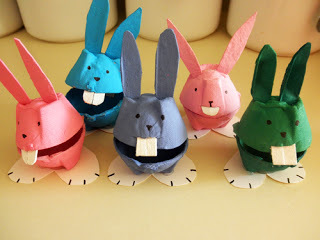 Use your old egg cartons and some paint or markets to make adorable egg carton rabbits. They can even hold candy inside! You can use old egg shells to make beautiful DIY Eggshell Planters for decor. Who knew? 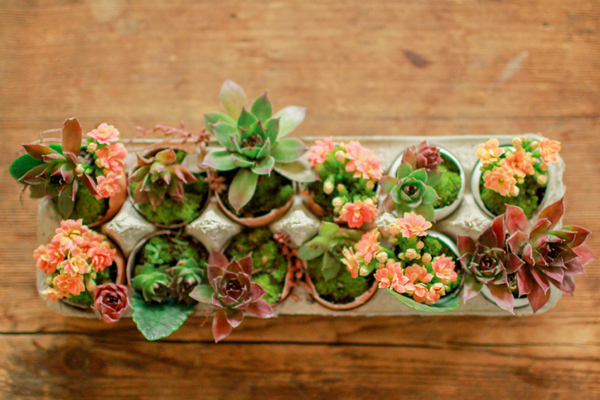 Egg shells work well with succulents and flower blooms to create a modern, but beautiful look. Ever wonder why Easter is on a different day each year? Me too! The date of Easter Sunday changes every year because it’s celebrated on the first Sunday after the Paschal Full Moon. This varies each year so Easter Sunday can be any time from March 22nd to April 25th. Still confused? Me, too! And guess what? Wikipedia can confuse you more if you really want to know the Easter details. If you know of any more awesome Easter crafts, please share them in the comments section because I love new ideas! This post on DIY easter decorating ideas co-written by Annabelle Absar, a senior at Belmont University. Yes, sorry about that. She is having temporary host issues and the link will probably be working tomorrow. Thank you for featuring the origami rabbit basket, one of my favorite origami figures. It is a delight to make and to give away for Easter! I went to wikipedia and you’re right, they make it confusing! Here’s the truth on Easter in a simplified way… Jesus was born into this world, lived a perfect life while serving those in need, especially the lowliest. But those who hated Him nailed Him to a cross and crucified Him. And although it sounds like Jesus “lost”, it was all part of the plan. God’s plan. It’s a love story. He stayed on that cross to bear the sin of the world, our sin. He died for us. But even more amazing than that, to show His power over death, He ROSE from the grave 3 days later. Jesus won! Now there’s hope, salvation and eternal life with Him! ANYONE willing to accept, that is. I’m extremely impressed with your writing skills as well as with the layout on your blog. Is this a paid theme or did you modify it yourself? Either way keep up the nice quality writing, and I really like these Easter craft ideas. What great Easter crafts and decor. Thanks for all the fun ideas!